The study "Sofa market in Europe" analyses the upholstered furniture market in 30 European countries providing data on production, consumption, imports and exports of upholstered furniture and an analysis of both the competitive system and the supply structure. Company information and business performances for the top European furniture manufacturers in the sofa segment are included. -	over 200 direct interviews with leading upholstery companies and key testimonials, conducted both via an online survey and face-to-face interviews. -	analysis of sector documentation from CSIL's databases, which were created in 1980 and have been updated annually. An executive summary provides a complete and detailed presentation of the upholstered furniture sector in Europe, looking at market trends and structure and at the competitive system with an independent assessment of the sector’s performance and prospects for the coming years. Chapter I Basic data. 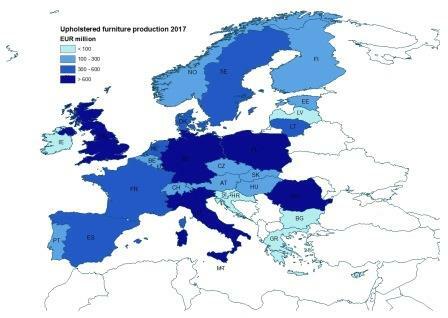 Production, consumption and trade, providing an overview of the European upholstered furniture industry and market through updated statistics and through tables, graphs and maps for Europe as a whole and for each country. The data are given both in value and in volume. Chapter II The competitive system for European sofas provides rankings of the top European sofa manufacturers, company shares of total upholstery production, breakdown of company turnover by product specialization, plant location, employees, major European sofa exporters. The chapter also provides detailed profiles of 15 of the top European furniture players. Chapter III European sofa supply offers an analysis of the types of products manufactured by European upholstered furniture manufacturers, with tables and information on the actors operating in each segment: by price range (economic, middle, upper), covering material (leather, fabric, other materials including artificial leather) and destination (residential/contract). Chapter IV The recliner sofa industry in Europe focuses on the motion/recliner upholstered furniture industry in Europe, by estimating the European production in this segment by country and investigating the main characteristics of the supply, type of mechanisms (manual – power), number of seats (sofas – chairs), covering materials, and price. Tables show the main European players’ shares of motion supply, short profiles of the main extra-European manufacturers in the segment are also provided, along with a list of suppliers of recliner mechanisms. Chapter V Analysis by country, a report is provided for each upholstered furniture producing country detailing: country ranking at world and European level, basic segment data 2012-2017, data for production and consumption in value and volume, imports and exports by country and geographical area. For the major European countries, the chapter offers an analysis of the type of products manufactured by European upholstered furniture firms, with tables and information on the actors operating in each segment: price range (economic, middle, upper), covering material (leather, fabric, other materials including artificial leather), destination (residential/contract); the report provides a supply structure analysis (price range, covering material, residential/contract) and motion/stationary distinction and a ranking of the major local sofa manufacturers by upholstered furniture turnover.